iPhone iBooks to Computer Transfer for Mac - Transfer ePub, PDF, Audiobook from iPhone to Mac. Transfer ePub, PDF files from iPhone to computer in case your computer doesn't work or you have to fix iPhone when it necessary. How to backup iPhone books for recovery. 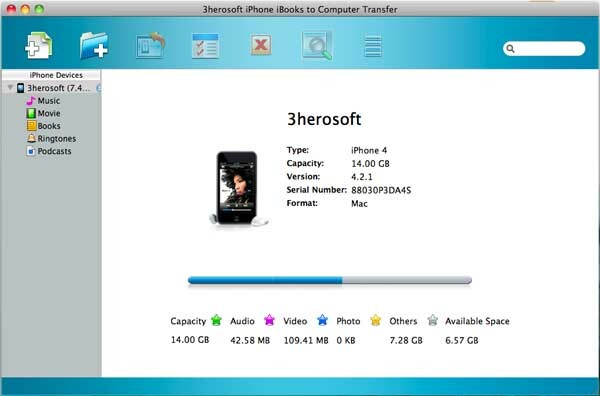 3herosoft iPhone iBooks Transfer will allow you to easily transfer those books from iPhone to computer local. For purchased or free downloaded books on iPhone Store, you can also easily transfer them to Mac local or sync to iTunes library. Moreover, You can import music, video files to iPhone library or sync them to iTunes library. When your iOS devices upgrade to iOS 5, all ePub, PDF files are allowed to transfer to iPhone library without iTunes. Now iTunes 12 is supported by this iPhone iBooks Transfer for Mac program. You can easily browse books info, and create playlist or organise iPhone collection. All types of iPhone including iPhone 3, iPhone 4, iPhone 5, iPhone 5S/5C, iPhone 6/6 Plus, etc. will be linked to this program well. Transfer iPhone ePub, PDF, Audiobook from iPhone to Mac for backup. Transfer purchased/free downloaded books (ePub, PDF, Audiobook) on iPhone to Mac and also allow you to sync them to iTunes library. Import ePub, PDF files to iPhone 3/iPhone 4/iPhone 5/iPhone 6 after you upgrade iOS devices to iOS 5.0. This Mac iPhone iBooks Transfer can transfer Music, Video, Podcast, TV Show from iPhone to Mac. Transfer Music, Video, ePub, PDF from Mac to iPhone without using iTunes, much easier than iTunes! You can open your iPhone 3/iPhone 4/iPhone 5/iPhone 6 with Finder like an external hard disk. After connecting iPhone/iPod/iPad to Mac, the interface of the program will display the device info automatically including the type, capacity, version, serial number, and format. How to transfer iBooks files from iPhone to Mac? How to transfer purchased books (ePub, PDF, Audiobook) on iPhone to Mac? How to sync iPhone purchased/free downloaded books to iTunes library on Mac?